This is not spectacular progress, but it’s progress. 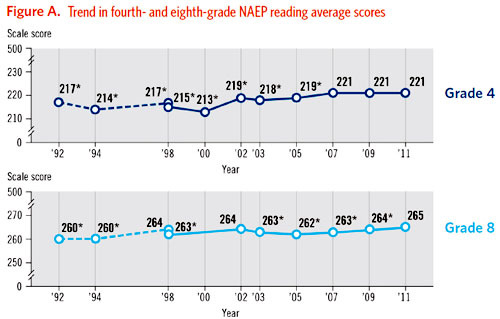 Since 1992, the number of students testing “Below Basic” is down significantly in both grade levels for all ethnic groups, and the number of students testing “Proficient” or above is up a fair amount. Test scores for 11th graders are usually not as encouraging: most of the gains in 4th and 8th grade seem to wash out in high school. But we’ll have to wait a bit to see those scores. For the time being, it appears that we’re continuing to make steady but slow progress. 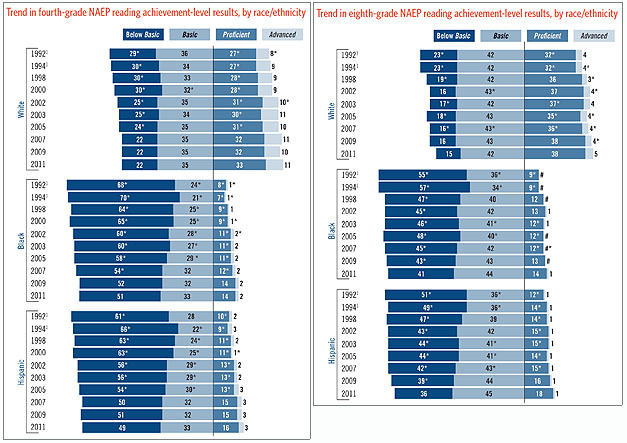 Whether that’s good enough is a different question, and not one that the NAEP can answer. This is just a bit of raw data for your consideration.